If Apple were truly serious about integrating iPads into education then they need to implement an overhaul of the iOS to incorporate multi user log-ins. For the iPad to operate with ease across the board educationally then the attitude that the iPad is a purely personal device needs to be challenged. On a personal level, I will customise my iPad, making it an extension of my personality and an indication of my personal workflow. I will try out, move and delete apps as they fit into the way I work, how I like to play and how I choose to be entertained. As an educator I need a set of iPads that I can use with multiple students and even multiple classes. 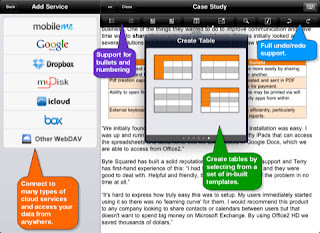 I need students to be able to to customise their own app selection to compliment their learning styles. I need a system where each student has a partitioned space that is their own. I need them to be able to create, construct, present and then save their own work to their Dropbox or another cloud storage solution. I am aware you can set up more than one email account on an iPad and you can password protect the device so that student are unable to access it without your permission, but this now needs to go further. I need secure user accounts that also address issues like resource and application sharing. 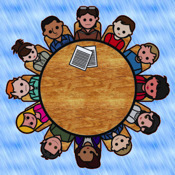 I need to share apps between students and groups of students. Can the iPad have multiple itunes accounts set up on a single machine or can a single itunes account have multiple users on multiple machines. Surely it is not impossible to have a class itunes account where each student personalises their learning tools to suit their preferred learning style from the collective apps. Each school could develop a library of appropriate apps for the units of work they are studying or even the teaching and learning styles they have decided to model to their students. If we really want the iPad to revolutionalise the way that our students learn then the Apple juggernaut will need to relinquish some control of the infrastructure (I know this is unlikely but it needs to be said). If the iPad is to make serious long term inroads into the classroom than serious consideration needs to be given to creating a reasonable solution for teachers who want to implement and integrate this type of technology. All apps are created equal but some are more equal than others. I love the mirroring capabilities of the iPad 2. This means that a lot of prep work is taken out of the teacher's hands. They can just plug in the VGA adaptor and mirror their iPad screens on a data projector or HDTV. But what of the guys who were early adaptors. The original iPad did not have this function and they have been trying to work around it since its release. Sometimes they spent an inordinate amount of time planning to present a lesson only to find out at the last minute that the Apps they wanted to use did not support the technology. 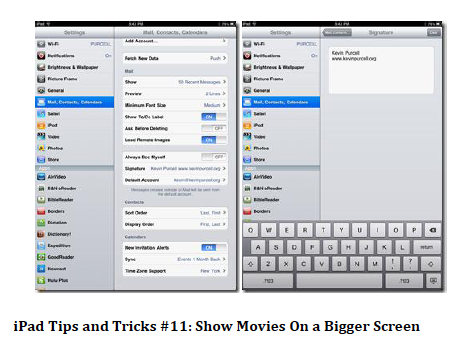 Some apps can be displayed, mostly videos and slide presentation apps, but not many others. The following are a collection of Apps that all support VGA output. At least if we have a list of Apps that support the original iPad technology we can plan to incorporate them into our lesson plans from the beginning - and save some prep time. It really was an oversight on the part of the developers not to have this code written into more of the education apps. We need to insist that as more apps are developed this is included so the original ipad owners get the benefits of the VGA out for video. How many times have you had to send a student back to complete a proper bibliography for an assignment or project. How many of your struggling students do not understand the correct bibliography process. Students can not see the need for bibliographies but lose marks because it has not been done correctly. Many school even have a cover sheet that the students sign to say that the assignment is all their own work and that a correct bibliography has been provided. 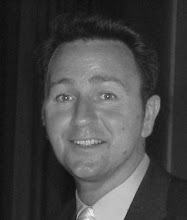 Press Release: New York, May 24, 2011 – From the very beginning, EasyBib has worked to make the old, painstakingly complex bibliography process simple and easy. 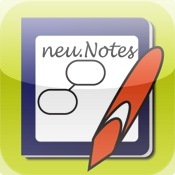 Now, with their brand new iOS application, citing references just got even easier! 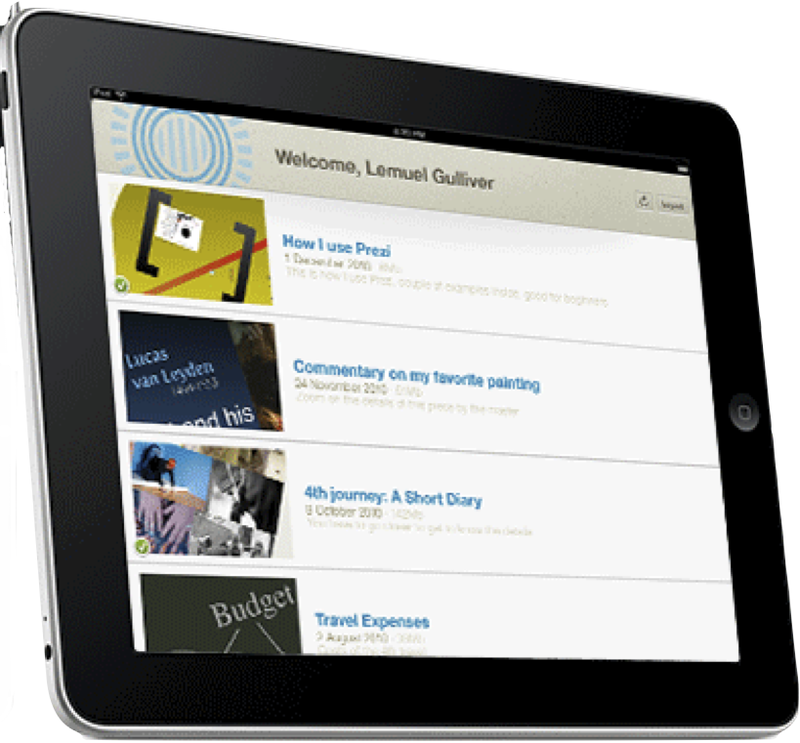 Once the new app is downloaded, writers can use their iDevice camera to quickly scan the barcode of a book, or just type in the book's name and, within seconds, an accurate MLA, APA or Chicago style citation is created. After that, the user can add more citations, or email and export the citations to EasyBib.com's popular bibliography management service to be added to other citations being collected. 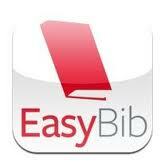 With the EasyBib app, writers, researcher and students can use their iPhone, iPod 4th Gen or iPad to quickly scan the barcode of a book, or just type it in and the bibliography is created for you. Either save it, include it in your research task or email back to your desktop. 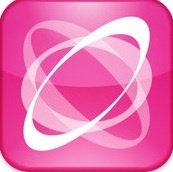 Nice little app that is very useful for education. 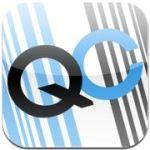 The Quick Cite app, available on both iOS and Android for US$0.99, will transform any book's barcode into a properly formatted citation. The user simply takes a photo of the book, magazine or journal's barcode, and the app automatically emails them a citation formatted in APA, MLA, Chicago, or IEEE format. 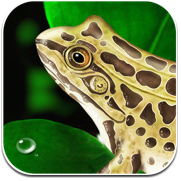 This app has excellent uses in education and more specifically in the classroom. I can think of a dozen reasons why this would be useful to a teacher. The offline tabbed browsing and file download features are really good but the ability to share your iPad screen over a HDTV is what really opens this app to the education sector. This is especially true for those schools that still do not have data projectors in every room. It is an app that certainly gives us another option anyway! 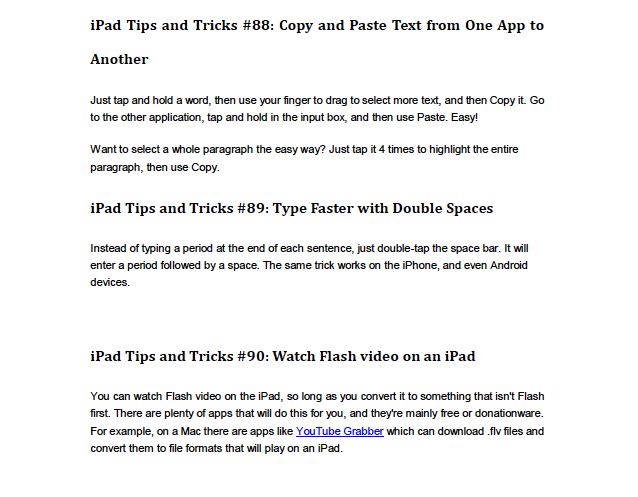 The article was put together by the guys over at http://www.ipadcreative.com. In the UK, BBC iPlayer is a big deal for TV catchup, in Australia it is the ABC iView and importantly on-demand TV, but both the iPlayer app and website play video inside the native resolution, which doesn't cut it when you are sat 16 feet away on the other side of the room. The students are very happy! We think this entirely justifies the very reasonable $2.49 price tag for iCab Mobile [iTunes link] and we hope this will help those of you hoping to have fullscreen display out of your iPad 2 via the Digital AV Adapter, for web content at least. 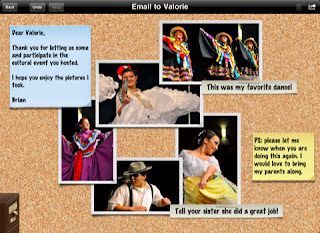 Here is an excellent way to utilise the iPad in your classroom. Put together by Cyndi Danner-Kuhn over at technologybitsbytesnibbles. This is the sort of workflow advice that teachers using iPad in the classroom needs. Creating a global learning community with the best teachers in the world. 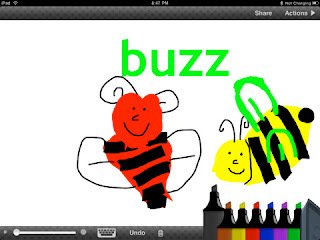 Easily record interactive lessons on your iPad and share them instantly online – reach more students, more easily. ShowMe is an open learning community where anyone can create and share instructional content. Teachers and experts can reach more students and showcase their expertise. 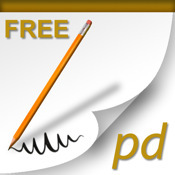 Students can watch lessons for free, plus ask questions and collaborate. ShowMe brings together great instructors and motivated students under one roof. The app is in beta, so you have to sign up to receive an invitation to get the app. I am waiting for my invite now. 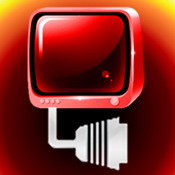 Clif has a great video that will show you what the app does. 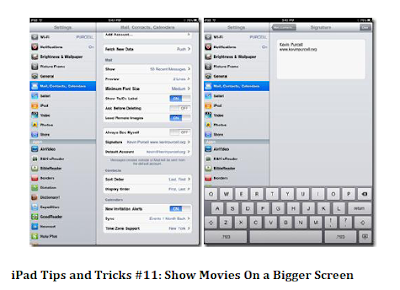 This post has some of the tips and tricks that we have seen before, however it also covers some of the basics that you might have forgotten or would be really handy to a new iPad owner. There were quite a few things here that I had not seen before and will find really useful. 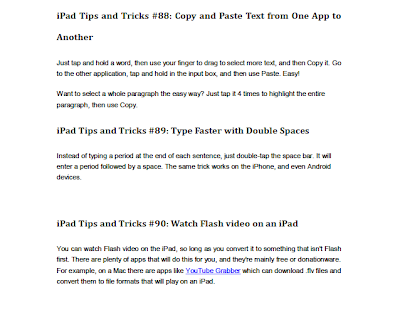 It is a well written and easy to read guide to getting the most from your iPad. It is set out with images and graphics that let you know you are on the right track. Worth checking out. As teachers one of the most important aspects of our day is the way that we present information. It does not really matter what our pedagogical philosophy is, at one point or another during the day we all need to present. If we are going to use the iPad in our classroom shouldn't we be modelling to our students the appropriate apps or presentation tools. We have earmarked 15 Presentation Apps for the iPad that coupled with a VGA adaptor will allow you to present with ease and elegance. Whether in the classroom, the network meeting or even the Boardroom. Keynote for iPad is almost as powerful as the Mac desktop application. This is a powerful presentation tool that has animations, slide transition and all the features to make professional slides on the run. It allows you to open templates with graphics already inserted. These are simply placeholders that disappear when you drop your own graphics over the frame. This is purposely built to work seemlessly on the iPad and to allow the user to incorporate other aspects of the iWork suite. Perfect addition to any homepage. 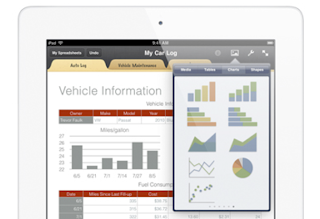 OmniGraphSketcher for iPad allows you to quickly create high-quality charts and graphs without the need for complicated data plotting software. 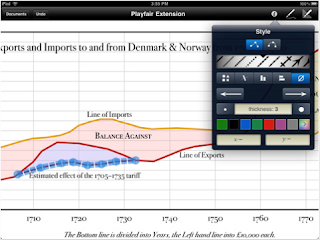 The simple, intuitive interface automatically turns your freehand sketches into elegant, professional graphs. Behind the scenes, OmniGraphSketcher takes care of all the mathematical details so your graphs don't just look good, they're beautifully precise. 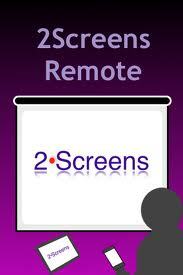 2Screens is a fully featured application for document manager, web browser, file viewer and whiteboard with VGA-output to outside projector or LCD monitor. The various tabs mean you can control the screen with PDF files, spreadsheets, web content and photos or images files & show your presentation easily. You can mark whiteboard tab while still using the current slide as the background. 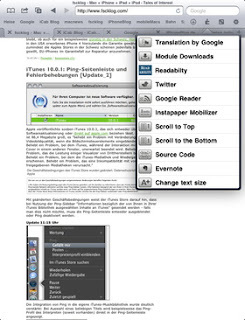 A PDF picture engine is available for fast PDF loading and allowing thumbnail display. During the presentation, a thumbnail of the PDF slides are shown in the "Slide Navigator" for easy preview. For those people who do not have the luxury of working in an all MAc workplace - Office² HD. 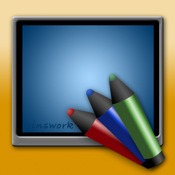 You can view, edit and create Microsoft Word compatible documents and Microsoft Excel compatible workbooks on the iPad. Additionally, Office² HD acts as a local file store, letting you store and view files of most types. Office² HD also integrates with Google Docs and MobileMe iDisk, giving you access to your valuable data, wherever you are. 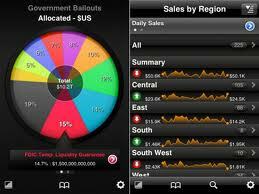 You can create tables and charts, add photos and graphics and enter and edit data — all with your fingers. 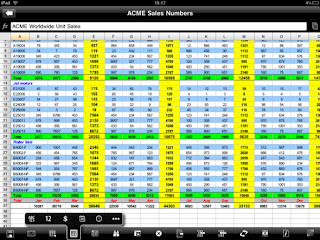 Numbers isn’t just a spreadsheet application — it’s a flexible canvas. Which means you can add multiple tables and charts anywhere on a sheet and move them wherever you like. Drag your finger on a table to add, delete or move columns and rows. 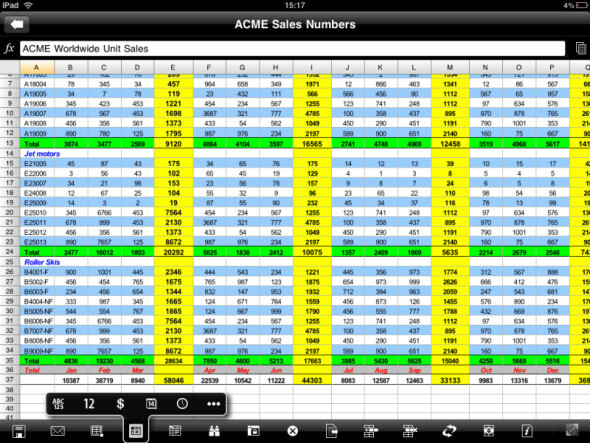 With a tap, enter and edit data.With Numbers on iPad, you can open Numbers and Microsoft Excel files. It works the other way around, too. Documents to Go has been around for a while so big things were expected from them on the iPad and for the most part, Docs to Go doesn’t disappoint. 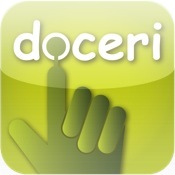 Docs to Go is a single app that supports a wide array of files for viewing and Office files for editing. The launch screen is divided into several sections; Local files, Desktop files, Online files, Recents, Search and Settings. Yes, Docs to Go has a very robust means to access your files and search them. 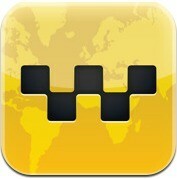 A excellent app for working on documents on the go. 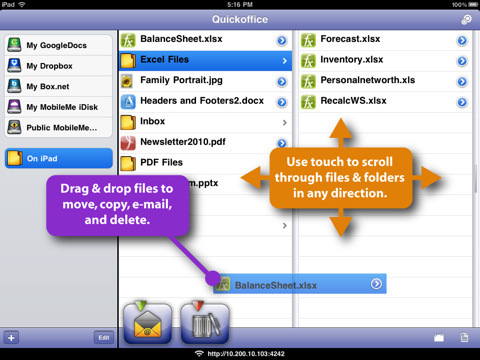 Quickoffice Connect allows users to create new documents in Word, Excel, and PowerPoint formats, import and edit documents and lastly but not least view PDF files. 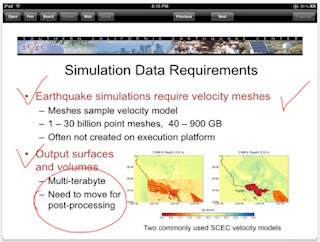 These capabilities alone aren’t unique: other Apps support editing and saving documents in Microsoft’s established formats. 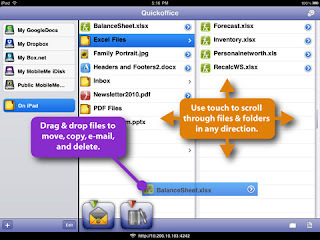 What makes Quickoffice Connect stand out from the pack of iPad office suite pack is its professional interface and a solid, straightforward document management system. 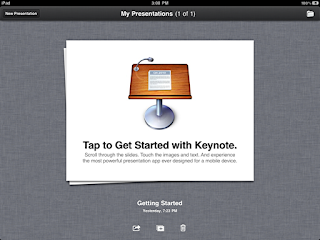 Show your Prezi on your iPad. 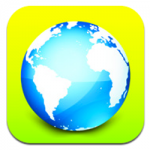 Drag to pan, and pinch to zoom in or out of topics – just like you do in any map app. The Prezi Viewer lets you show your prezi as your meeting or conversation develops – in the exhibit hall or office hallway. Show your prezis anywhere With the Prezi Viewer app, you can show your prezis on your iPad on a portable, lightweight device – anywhere you go. Use it intuitively, instead of clicking on buttons, you can leverage the touchscreen to simply pan and pinch to zoom and move around the prezi. Keep the focus on your prezi. On the iPad, you can show your prezi without the distractions of multiple, open browser windows. Roambi Lite is a free online publishing tool that transforms your Excel data into interactive charts and graphs - and instantly sends them to any iPad. 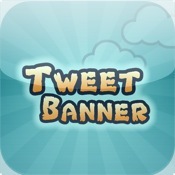 This is an excellent tool with fantastic graphics. Its unique user experience lets you quickly and intuitively access and analyze up-to-the-minute company information for faster, smarter decisions - whenever and wherever you make them. Wow any audience with these charts and graphics when presenting your data. 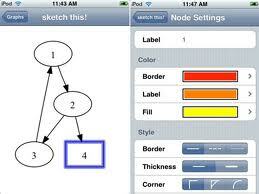 Sketch some rough shapes and lines, and Instaviz magically turns them into beautifully laid-out diagrams. Throw away the exercise books and paper napkins, Instaviz will figure it out for you. 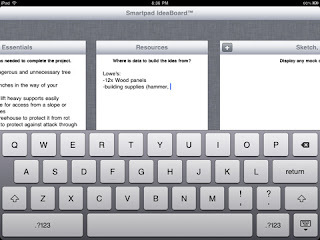 Brainstorm and conceptualize like you use pencil and paper, without a pesky interface getting in your way. Then with a couple of taps, share your diagrams with friends and colleagues through email and web. 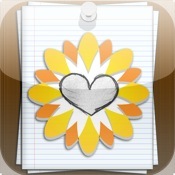 This is a simple to use whiteboard app available for the iPad. It is a easy way for you to record your ideas anywhere. 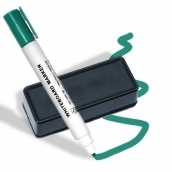 It provides a clean end product with excellent sketch facilities especially when you use the graph paper. Good to use for recording students brainstorms or discussions. 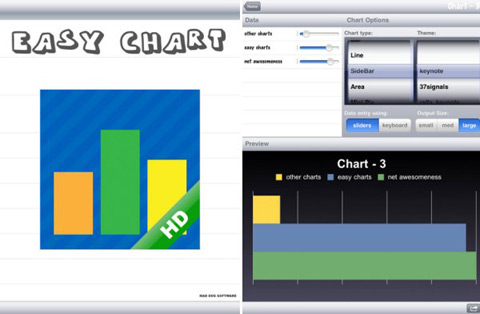 In Easy Chart HD you can create line, bar, pie and sidebar charts easily. This application provides you simple and beautiful charts on your iPad. You can save in photos in different sizes like small, medium and large. You can also able to use this application without an internet connection. With a connection you can link your chart to social networking sites like Facebook and Twitter. Simple beautiful charts. 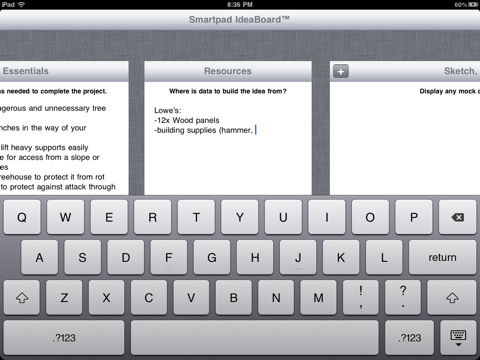 This is a great little app for creating idea boards. 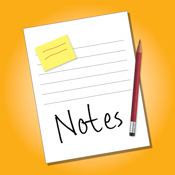 It has the ability to use labels or notes to record ideas as they happen. It incorporates to do lists and can import contacts from your address book. 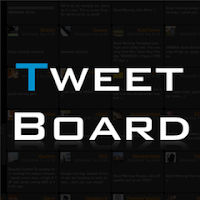 It also allows the user to paste up photos on an ever-increasing board to records your whole thought process. 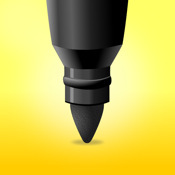 The app also allow for pinch zooming in order to go back and check the details of all those ideas.